‘Remember The Second Chance Institute (SCI). Earth’s benevolent non-profit by day, Thera’s totalitarian regime by night. They’ve stepped up their game on Earth and on Thera—infiltrating political parties, preying on the downtrodden, and planning offensive maneuvers. And they’re handing out more “second chances” than ever before. The SCI’s abuse of their charter leads to Arbiter oversight and bitter consequences. Like daynight, arbitrate is told from the point of view of three characters; Kira, Blake and Ethan. As I said in my review of daynight, Megan Thomason pulls off multiple perspectives perfectly and it isn’t confusing as you switch character. As well as being told from different perspectives, Thomason has also introduced past and present points of view from each character which really help develop the characters and fill us in on what’s going on in Thera and Earth. Again, this is easily sign posted so there’s no confusion. I feel like I’ve been put through the wringer reading arbitrate, I feel emotionally all over the place and I mean that in a good way. If you’ve read any of my reviews you’ll know that I love it when an author makes me feel the characters feelings and I really did reading this book. Not only did I feel one characters feelings, I felt three! Three! My poor emotions. Something else I’m a big fan of is unpredictability and this had heaps of that. arbitrate is full of twists and turns and there was no point where I thought I knew what was going to happen and I was right. The idea behind daynight and arbitrate is so refreshing. There are a lot of young adult books out there that use the same kinds of concepts and ideas, so it is so nice to read something completely different. 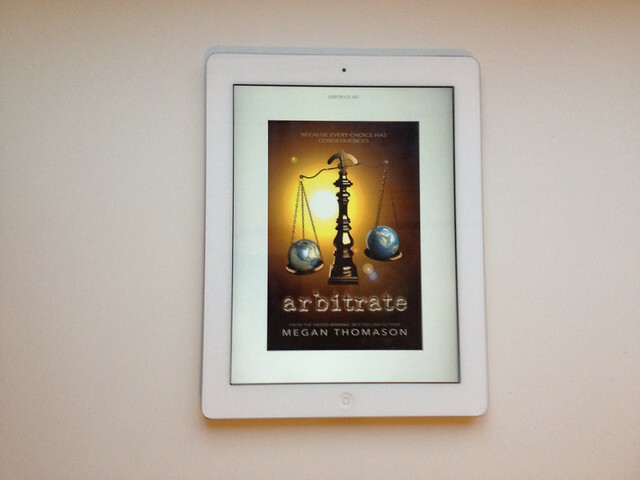 I really think (and I truly mean this) that arbitrate is the best book I’ve read this year. If you’re a fan of young adult / science fiction / romance novels you need (yes need) to read this book. arbitrate comes out on the 29th October. * – I was given an ARC in exchange for an honest review.